Ample parking, attractive gardens with patio and glorious views. Ideal for walkers, cyclist and all outdoor pursuits. 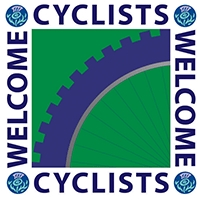 Cycle the Southern Borders Loop, Reivers Route 10 and the Newcastleton 7 Stanes mountain biking facilities. Secure bike storage, bike washdown and washing/drying facilities for your gear. Fantastic riding, golf, fishing and pony trekking nearby. An ideal base for exploring Scotland's castles, abbeys, country houses and the history, culture and wildlife of the Border Reivers country. Convenient for Kielder Water, Forest, Observatory and other attractions. Our dark skies are ideal for astronomers and star gazers. Visit the dark sky discovery website for more information. After exploring relax in one of our tastefully appointed rooms and our comfortable and cosy guest lounge with log fire or relax in our garden and watch the red squirrel and numerous wild birds that frequent our garden. Listen to the Curlew, Snipe and Lapwing out on the hills, or walk through our wood and pasture and spot some roe deer grazing, hares and birds of prey.